If you're one of the sad unfortunates who missed the third Dunk & Egg novella when it appeared in WARRIORS, the big cross-genre anthology I co-edited with Gardner Dozois, here's another chance to read "The Mystery Knight." 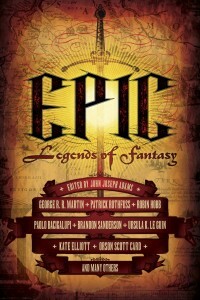 Demon anthologist John Joseph Adams is reprinting the novella, along with lots of other swell stories by the likes of Ursula K. Le Guin, Patrick Rothfuss, Tad Williams, and other kickass epic fantasists. This is My Quest: To Follow that Egg, no matter how hopeless, no matter how far.. Asking for 'The Hedge Knight' in UK book-stores invariably leads to being, helpfully, directed to the gardening section. Should I give up all hope for a Nicholas van Rinj yarn from you? Ah well, a new Dunk & Egg will suit me & my son just fine. No, it's in the queue. I can't wait for the Dunk and Egg Anthology of the first four...i know it'll be 2014 sometime due to licensing etc but still. And, if Winds of Winter DOES come that same year, I think the Anthology will come before it...just my two cent prediction. Are there any plans to turn the 3rd Dunk & Egg adventure into a graphic novel, like the first two? I really enjoyed it in that format and hope to see some more like that. Watch this space for an announcement. Awesome news! Before the HBO series came out, I used those 2 graphic novels to introduce my wife and quite a few friends to A Song of Ice and Fire books. Needless to say, we nerded out when Sir Duncan the Tall was mentioned during Season 1. No name for the fourth? Or are you still deciding on whether to call it The She-Wolves of Winterfell or The Wolf Women of Winterfell? Looking forward to it either way! Those were never real titles. Oh,thank you for the update. I love me some Dunk and can't wait for the new installment. While I've been lucky enough to get both GNs and the original books I look forward to the collection so I can share with my niece. Nobody borrows Dunk. Sorry, kid.